You may think I'm a clod of a man, but I have to confess something: "I don't get it!" I know that reality TV shows, especially those with elimination contests like The Great Race and Survivor are very popular, I don't get what all the fascination is over Dancing with the Starts. Over the last ten years, this show has been hugely popular in the United States. In addition, different versions of it have been popular in 42 countries. In the years 2006 and 2007 it was the most popular TV genre world-wide. But I don't get it. Other than getting to see scantily clad athletic professional dancers and to gawk at muscular professional dancing men with bulging muscles in girly costumes, what's the fascination? Especially the early weeks when these professionals have to drag around inept amateurs or gyrate while their amateur partners wave their arms and stand around embarrassing themselves. O wait: maybe I do get it! Now before you DWTS fans stone me, you need to know that I do like high quality ballet. Misty Copeland's Under Armour ad "I Will What I Want" shows that ballet is one of the most physically demanding sports as art. In addition, the music can be glorious! So I say, walk by the Spirit, and you will not gratify the desires of the flesh. ... [T]he fruit of the Spirit is love, joy, peace, forbearance, kindness, goodness, faithfulness, gentleness and self-control. Against such things there is no law. Those who belong to Christ Jesus have crucified the flesh with its passions and desires. Since we live by the Spirit, let us keep in step with the Spirit (Galatians 5:16-25). Notice especially that last phrase, "keep in step with the Spirit." If we are going to live the life of Jesus in our context and with our personality, we are going to have to let the Holy Spirit lead us in the dance of life! 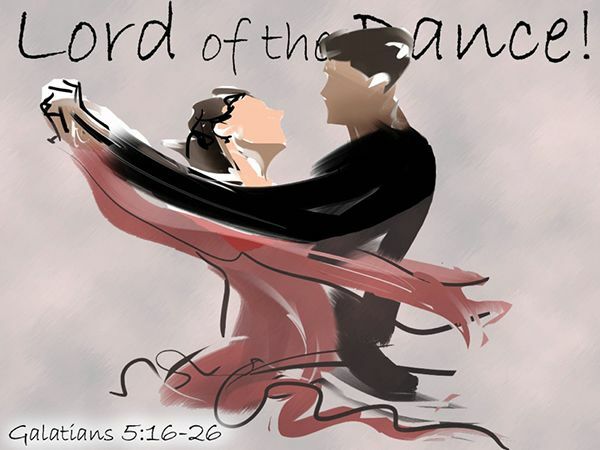 So as children of God seeking to learn the dance of life, how do we do we allow the Holy Spirit to be Lord of our dance? If we are going to live the life of Jesus in our context and in our personality, we are going to have to let the Holy Spirit lead us in the dance of life! We offer ourselves to God to be led by the Spirit. We are to be God's holy temple, the place where God himself lives and a person in whom the glory, honor, and praise of God are found (1 Corinthians 6:19-20). We offer ourselves as living sacrifices to God (Romans 12:1-2). We recognize that to experience the abundant life Jesus came to give us (John 10:10), we must let the Spirit lead. This means that we willingly must offer ourselves to God and follow the Spirit's lead! We do the things that allow the Spirit to fill us. 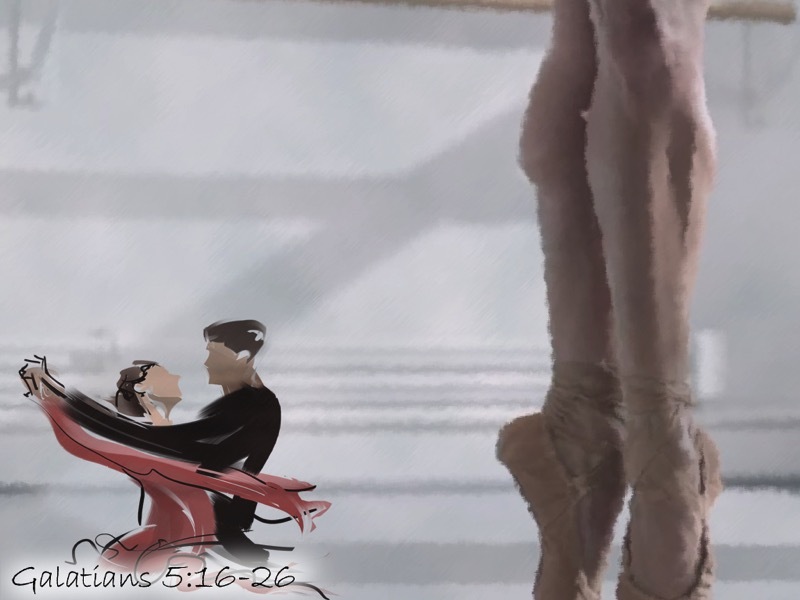 Like a good dancer, we enter the world of God's "music." That "music" fills us, envelopes us, and moves us to dance by the Spirit's rhythms. We enter this world through spiritual songs shared with other believers, thanksgiving focused on Jesus, and submission to those closest to us. As we do these things, the Spirit fills us (Ephesians 5:15-20). Paul emphasizes two other ways for us to enter into the "music" of the Spirit. One is through the word of God and the other is praying in the Spirit (Ephesians 6:17-18). 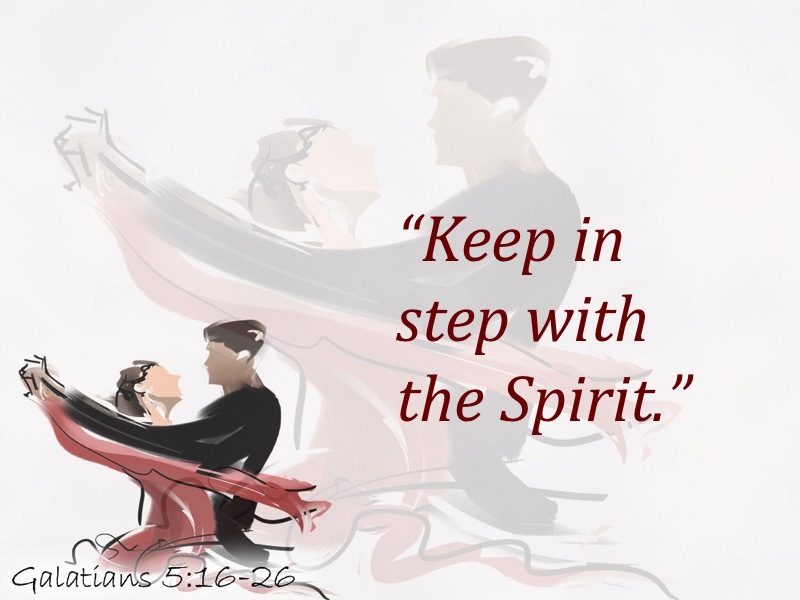 In these ways, the Holy Spirit fills us and leads us in the dance of life. We trust the Spirit to guide us and lead us through life's different challenges. Jesus promised to send the Holy Spirit as our Comforter — also translated as the Counselor, the Advocate, the Helper (John 14:15-18). The Spirit guides us into all truth and reminds us of Jesus (John 16:13). The Spirit convicts the world of sin and judgment (John 15:8-11) while helping us know truth from error (1John 2:20;1 John 2:26-27). Most of all, until we can go home to be with the Son and the Father, they will come to us, show themselves to us, and make their home in us through the Spirit (John 14:1-4; John 14:15-23). We check our lives to see if we are keeping in step with the Spirit. We seek to have the character of Jesus shine through our lives and we yearn for the fruit of the Spirit to come alive in us (2 Corinthians 3:17-18). We begin to display love, joy, peace, patience, kindness, goodness, gentleness, faithfulness and self-control — the fruit of the Spirit (Galatians 5:22-23). Our lives increasingly reflect the righteousness, peace, and joy of Jesus (Romans 14:17). Rather than being paralyzed by timidity and fear about our faith, we begin to see our lives filled with spiritual power, love, and self-discipline (2 Timothy 1:7). As we see the qualities of the Spirt come alive in us, we realize that we are learning to dance through life letting the Spirit lead us! We are "keeping in step with the Spirit"! "Keep in Step with the Spirit" by Phil Ware is licensed under a Creative Commons License. Heartlight encourages you to share this material with others in church bulletins, personal emails, and other non-commercial uses. Please see our Usage Guidelines for more information.